If you enjoy the beauty of Norwegian nature, love spending time outside, hiking, biking or kayaking, there is a new group for you! We talked about it with the leader of the new outdoor group at university, Kjerstine Mæhle Skjøtskift. 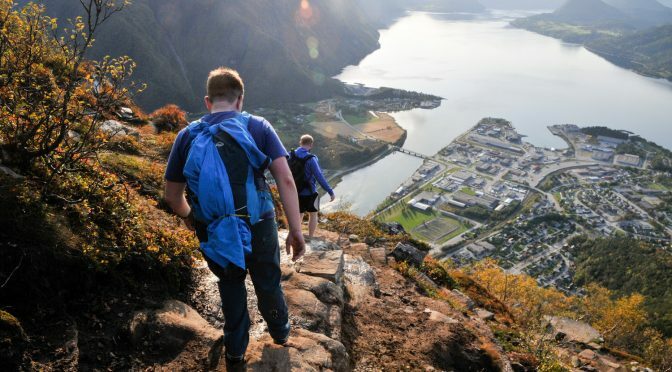 The purpose of the outdoor group, which is called iFri – Moldestudentenes Friluftslivsgruppe, is to offer students outdoor activity, hiking and to make new friends with the same interests. There already been a couple of successful events and there are many more to come this semester. As a first event, they organized a trip to nearby surroundings just above the Molde city, Moldemarka. Even though there was a lot of rain and bad weather, people still showed up and the trip turned out well. «We had to go down from the mountains in the dark using flashlights, which was a new twist,» said Kjerstine. By the end of the week, iFri organized another event. Another trip to Romsdalseggen was also very successful. With sun and blue sky, it felt almost like a summer. «We had dreamy weather, people were happy, and even on the top of the mountain the Snapchat filter said it was 19 degrees Celsius,» said Kjerstine. Even though it was more than a 10 kilometer long hike, which took nearly 7 hours, participants were still smiling when they got back home to Molde. If you would like to join the group for another great event, you don’t have to wait long, iFri is planning a biking trip around Sekken on Sunday 1st of October. «It will be approximately 22- kilometer long trip, which is going to take about 5 – 7 hours. There also might be time for a small hike and some BBQ,” described the plan Kjerstine. Furthermore the weather forecast once again promises nice weather. Another chance to join iFri is going to be on 4th of October on a trip to Trollkirka, a beautiful hike to a marble cave with waterfalls. On 14th October the group is going once again to to Åndalsnes, where you can try out climbing the branc new Romsdalsstigen via ferrata. «There is also going to be a paddling trip and indoor climbing in Moldeveggen. In the end of October, we are going for a hike to Rørsethornet and after that we are going to have some smaller hikes like Varden or Kringstadnakken during the exam period,» explained Kjerstine. You can find more information about iFri activities on Facebook page iFri moldestudentenes friluftslivsgruppe, Moldestudenten on Snapchat, or simply by following the screens at school and website www.moldestudent.no. Any student is welcomed to join the group for events to come. At the moment the organization has enough staff memebers, but if you are interested in arranging winter events such as ski trips, you can contact one of the leaders of the group; Kjerstine Mæhle Skjøtskift, Mari Bøe, or Vegard Øye.